I studied Jewellery Design at the University of South Australia. After graduating, I worked as a designer and sales consultant in Adelaide for several years before traveling to Japan to teach English for a year. One year in Japan soon extended to 8 years and, while living in Nagoya, I began creating jewellery again and exhibited and sold my work across Japan from Osaka to Tokyo. In 2009, I returned to Australia and am currently concentrating on 2 dimensional art works. 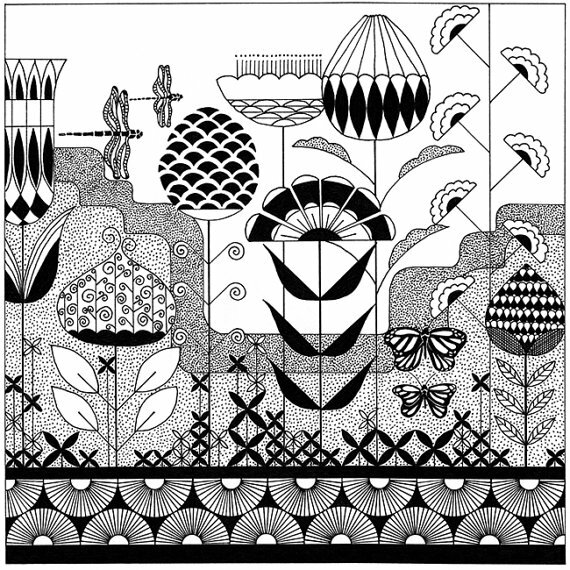 My recent work includes a series of small-scale black and white drawings inspired by nature, personal experience and my love of repetition and pattern making. My illustrations are delicate, intricate and show an attention to detail reflective of my background as a jewellery designer. I also love working with colour and creating original works in gouache or collages from coloured paper. My works are inspired by flowers, plants and leaves and these shapes and forms often represent human beings and their shared emotions and experiences. I hope you connect with these feelings, ideas or experiences and I hope my work will impart a sense of joy, happiness and inspiration to others.